Quick overview Brings together in one place the inextricably linked topics of professional development, reflective practice and decision-making Fully updated and revised throughout A range of pedagogical features, including learning objectives, activities, case studies and examples Written by renowned experts in the field. This essential text brings together in one place the inextricably linked concepts of professional development, reflective practice and decision-making. 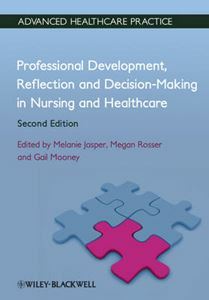 Fully updated and revised throughout, the new edition of this easy to follow, jargon-free title is targeted at nursing and healthcare practitioners and nursing students, providing clear guidance to help the reader think critically about their practice, work within professional boundaries, be accountable for their actions, and plan for their future.